A famous quote from Soichiro Honda, the legendary founder of Honda Motor Company, says “Racing improves the breed”. There's no doubt many Formula One teams have used that phrase to imply a legitimate link between innovations made in racing that eventually benefit us all as the technology from top-level motorsport filters down into road cars, although it would be hard to convince anyone of a practical use for an off-throttle blown diffuser in a family hatch back. Likewise solar racing cars have made significant contributions that have lead to today's current crop of mass produced Plug-In electric cars. It all started with the winning vehicle of the very first World Solar Challenge in 1987. GM's Sunraycer was designed by Hughes Aerospace, (the company originally founded by Howard Hughes) at the time a division of General Motors, in collaboration with a smaller aerospace company called AeroVironment. More than a dozen Caltech graduates participated in Sunraycer programs at AeroVironment, the most deeply involved was Alan Cocconi who was responsible for the power electronics systems. This included everything from motor controller through battery management to telemetry. The Cocconi designed MOSFET based three phase AC motor drive inverter ran a 92% efficient 10 hp (peak) motor that drove the left rear wheel of Sunraycer via a cogged belt. Sunraycer won Pole with a top speed of 109 km/h and lead the 24 car field from start to finish covering the 3,005 km route at an average speed of 66.9 km/h (41.6 mph), 50% faster than 2nd place. Following the World Solar Challenge success, in early 1988 GM insiders proposed the idea of making a very efficient EV with the knowledge gained from Sunraycer but to make it an affordable car with decent range and performance equal to a petrol powered car. Work soon begins at AeroVironment on the 'Impact' based around a 15 kWh Lead Acid battery pack, Al Cocconi again responsible for power electronics design. 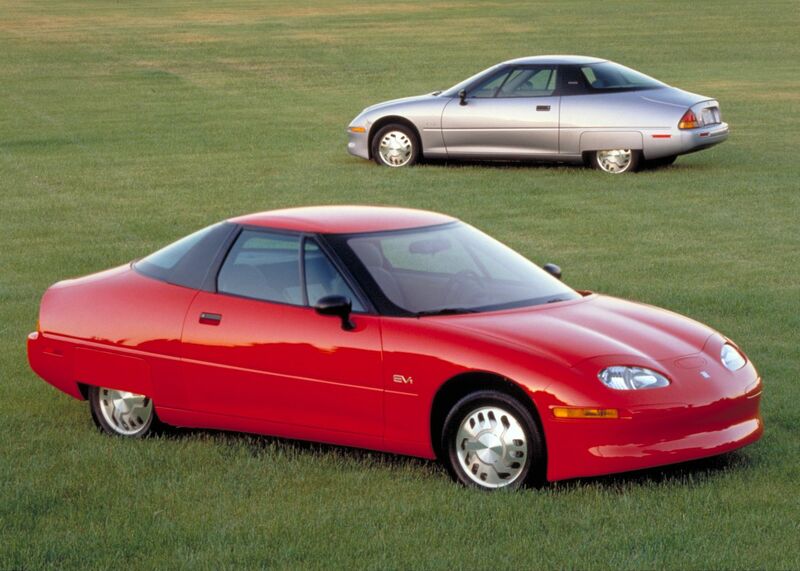 The Impact EV concept car was launched at the LA Auto Show in Jan 1990 and the car was so well received that by April GM announced the car would go into production. The Alan Cocconi designed motor controller for the Impact, a direct descendant of that used in Sunraycer, was refined by Hughes Electronics and went into the GM EV1 when production started in 1996. Based on his work to date, in 1992 Alan Cocconi founded AC Propusion to produce electric vehicle drive systems featuring high performance, high efficiency induction motors and integrated high power battery charging. The original test bed was a not too glamorous Honda Civic but once the powertrain design was debugged, a Piontek Sportech kit car chassis, originally designed around a Suzuki GSX-R motorbike engine, was converted into an EV sports car called t-zero. Launched in 1997, the 1040 kg t-zero, powered by 28x lead acid batteries, started to make headlines with it's 0 to 100 km/h in 4 seconds levels of performance. By 2003 the car had been upgraded with 6,800x 18650 Li-ion cells giving a single charge range of 480 km, a 320 kg reduction in kerb weight and 0-100 km/h times reduced to a Supercar beating 3.2 seconds. If some of these specs sound similar to the Tesla Roadster, that's because the Roadster was developed by Tesla Motors to mass-produce AC propulsions t-zero, the first EV to demonstrate the performance and range potential of lithium ion batteries and the car that can legitimately be credited with inspiring today's mass produced plug-In electrics from GM, Nissan, Mitsubishi etc. Tesla Motors was founded to commercialise Alan Cocconi's work and the Tesla Model S still uses technology licensed from AC Propulsion. Today's solar racers are still blazing a trail years ahead of the automotive industry, witness BMWs i3 Electric car, the first all carbon fibre production car. Every WSC winner since 1999 has achieved up to 98% drive train energy efficiency by using direct drive in-wheel motors (road car in-wheel motors are currently being developed) and surely it won't be much longer before the 12.5% of Australian homes that have roof-top PV systems installed realise they already have the infrastructure in place to solar power a plug-in electric vehicle for their daily commute? Disclosure: This post is sponsored by Bridgestone World Solar Challenge. Words and thoughts are entirely my own.